Despite the fact that small dogs seem to be all the rage with celebrities, many dog lovers prefer a dog that is larger than a cat. I'm not talking about just big dogs—no way! I'm talking giant: the bigger, the better. You might be thinking, "Big dogs? Well obviously that's either a Great Dane, Irish Wolfhound, or Newfoundland." There's no question that individuals in those breeds tend to be very large. In fact, the tallest dog on record is a Great Dane and the heaviest is an English Mastiff. But does that mean that these breeds are, on average, the largest? If you do a quick search of the Internet, you will find quite a few lists of the largest dog breeds. You'll see the same ones listed over and over again, and I'm sure you already have an idea of which those are. However, sometimes you'll come across an unusual breed that should be on a list of the largest but isn't. Usually, this is because many of these lists use AKC (American Kennel Club) standards in determining which breeds make their list. What these lists fail to take into account is that the AKC does not recognize all dog breeds. In fact, there are a couple very large dogs that aren't even on their foundation stock lists. However, this list of the top 10 largest dog breeds doesn't stick with just the AKC or even the FCI (or Fédération Cynologique Internationale, an international federation of kennel clubs) standards. If it's a large dog breed recognized by at least one legit kennel club, it's fair game for my list! Since I'm talking "largest" dog breeds, I probably don't need to specify "only breeds over 75 pounds" or "only over 26 inches." 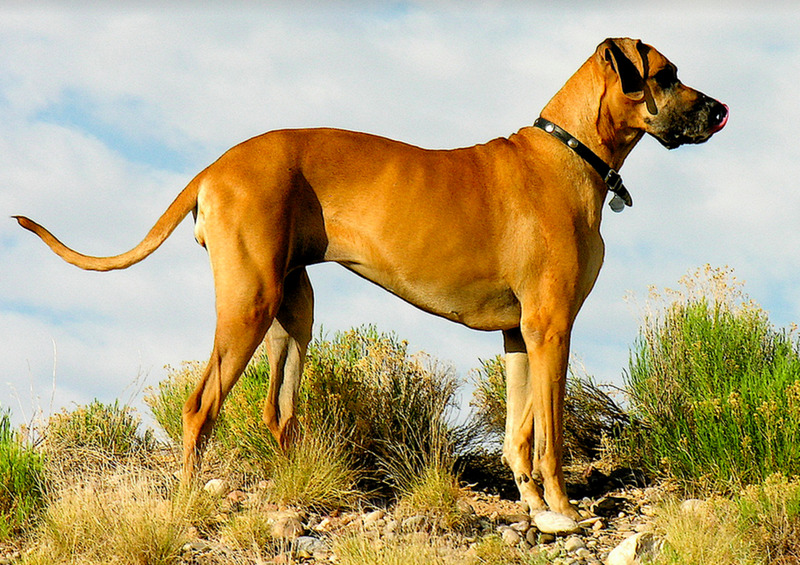 These breeds are, on average, the tallest, heaviest, brawniest dog breeds in the world. Most of these breeds average well over 175 lbs of pure canine muscle (with a little fluff thrown in). How could you not love a face like that? 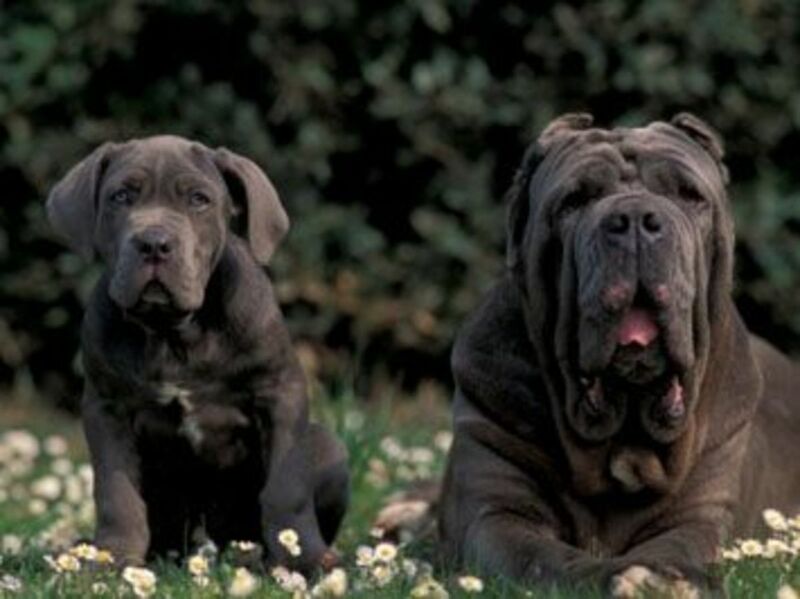 The Neapolitan Mastiff (also known as the Italian Mastiff) comes in at #10. Males average 30 inches tall (at withers) and about 165 lbs. Breed standards generally place the upper limit of height for males at 31 inches, though it doesn't seem they are penalized for being taller as long as correct body proportions are maintained. "Massiveness" is important to the breed standard; a dog can be disqualified if it doesn't have the appearance of massiveness. Despite their large, imposing exterior, Neapolitan Mastiffs are generally gentle and protective of their family, aloof, and wary of strangers. As such, a Mastini needs to be properly socialized from a young age; these powerful dogs often don't mean to throw their weight around, but they do! #9 is the Leonberger, a gentle lion from Germany. These large, sweet dogs average around 30 inches tall and weigh in around 170 lbs. 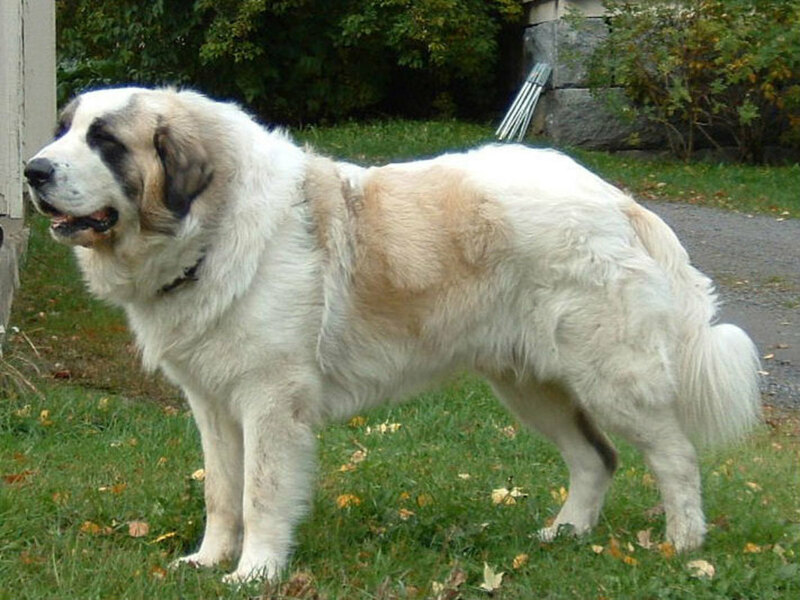 The breed was developed near the town of Leonberg, Germany (hence the name) in the 19th century using a female Newfoundland and a male St. Bernard. Throw in a little Great Pyrenees a bit later and voila! A gentle giant that exhibits the best traits of all its ancestors. Leonbergers are well-known for being family dogs. They are generally calm, docile dogs that play well with other animals and with children. 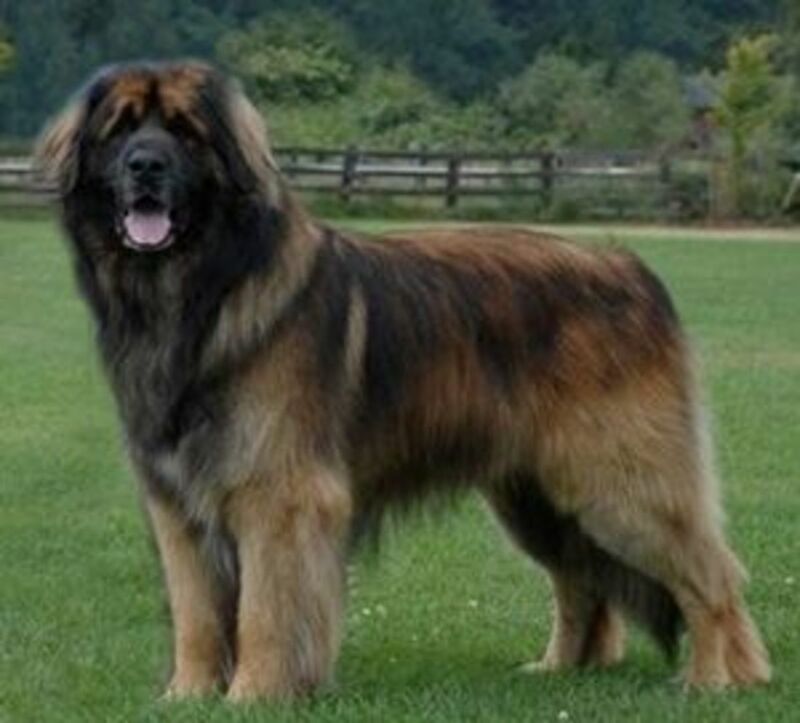 They were originally seen as a status symbol but owners were quick to realize the Leonberger's great potential as a home and flock guardian and for draft work. Like St. Bernards and Newfoundlands, Leonbergers are often used in search-and-rescues, even in water. Amazingly, only eight Leonbergers were known to have survived WWII. Careful breeding and stewardship brought them back from the brink of extinction. 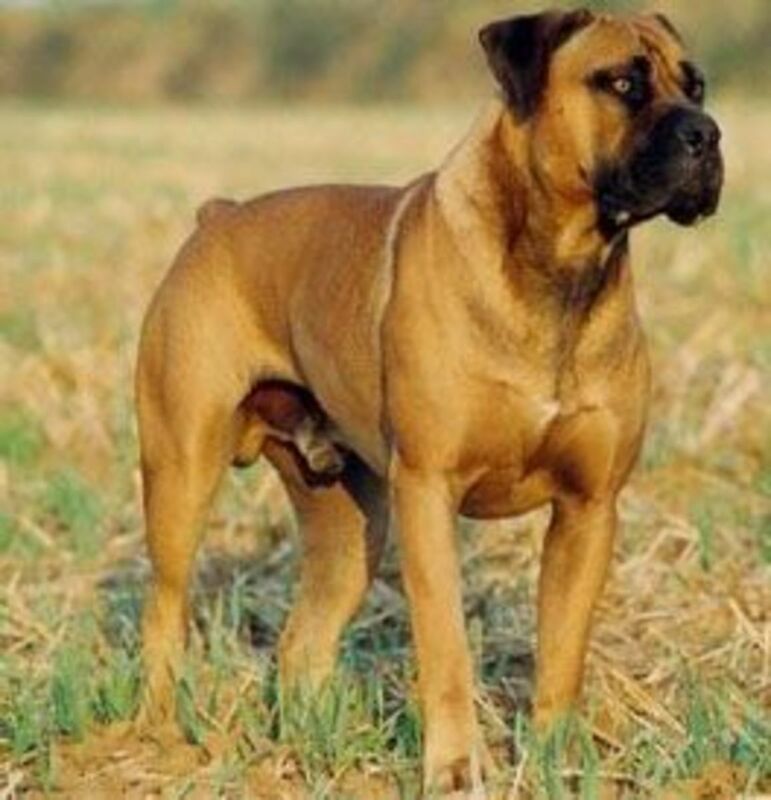 The Boerboel, or South African Mastiff, was bred specifically for guarding the homestead and flocks in South Africa. As you can imagine, you'd need a fairly sturdy, fierce dog to protect your farm from typical South African predators (hyenas, lions, and other big cats). The Boerboel's character—calm, confident, loyal and territorial, without being overly aggressive—was well-suited to this job. The breeds size helped as well: males typically stand about 27 inches at the shoulder and weigh around 175 lbs. 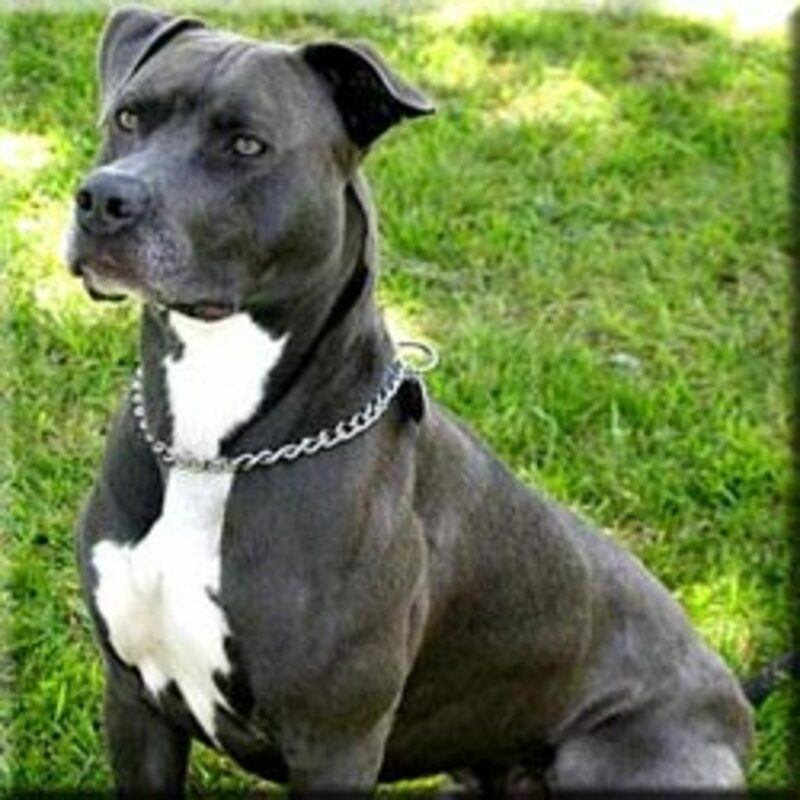 Unfortunately, the breed has developed a reputation as a fighter and has actually been banned in Denmark. The qualities that made the Boerboel perfect for guarding South African homesteads—confidence, a territorial nature, and a tendency to protect to the death—make the breed well-suited to pit fighting. Without proper training and socialization, the Boerboel's protective nature can turn into aggression, towards both people or other animals. As its name suggests, the Central Asian Ovcharka (shepherd dog), also known as the Aziat, hails from Central Asia (Kyrgyzstan, Turkmenistan, Kazakhstan, Uzbekistan, and surrounding countries). The CAO (for short) is commonly used throughout Central Asia as a flock guardian. The breed is also popular in Russia, where it is often called "volkodav" ("wolfhound") or "volk drobilka" ("wolf crusher"). There are many breed standards for the Central Asian Ovcharka, but most agree that the dog should be "greater than average-sized with great power and strength." Males are often upwards of 32 inches at the withers and usually weigh around 175 lbs. These dogs are still often used as guardians of both home and flocks, but also for hunting and fighting. Like any other dog that is bred for fighting, the CAO can be aggressive, but most are loving family members and work well with other members of their pack. In fact, in many registries in the region, CAOs must pass an "original purpose" test before being registered. Overly aggressive dogs would naturally not pass this test. I was recently introduced to these beautiful giants and had to add them to my list! Tied for the #7 spot with the Central Asian Ovcharka is the Giant Alaskan Malamute. These beauties stand around 35" at the withers and weigh upwards of 190 lbs. In contrast, the commonly seen Alaskan Malamute male stands around 25" inches and weighs about 85 lbs. That makes this pup one giant sled dog! 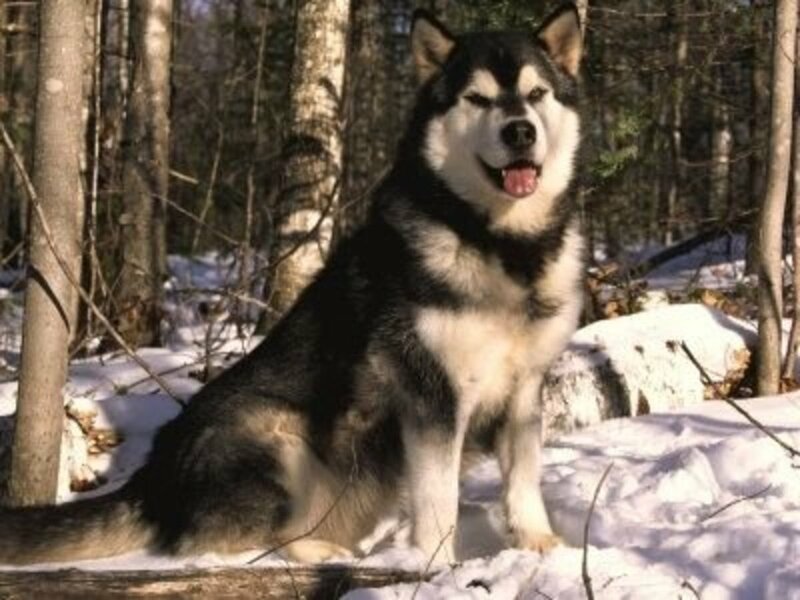 The Giant Alaskan Malamute is a descendant of the M'loot type of Malamute (the other two types being Kotzebue and Hinman-Irwin—check out this article on the history of the Alaskan Malamute for more info). The M'Loot type is typically larger than the others. Most (if not all) dog registries do not recognize the Giant Alaskan Malamute as a breed separate from the Alaskan Malamute. But because I love giant, fluffy dogs, I'm putting this one on the list! No, this dog isn't part lion. Tibetan Mastiffs, which tie for #6 with English Mastiffs, are large, have an imposing and fearsome appearance, and often possess an attitude to match! Despite its common name, this dog isn't actually a mastiff-type breed. 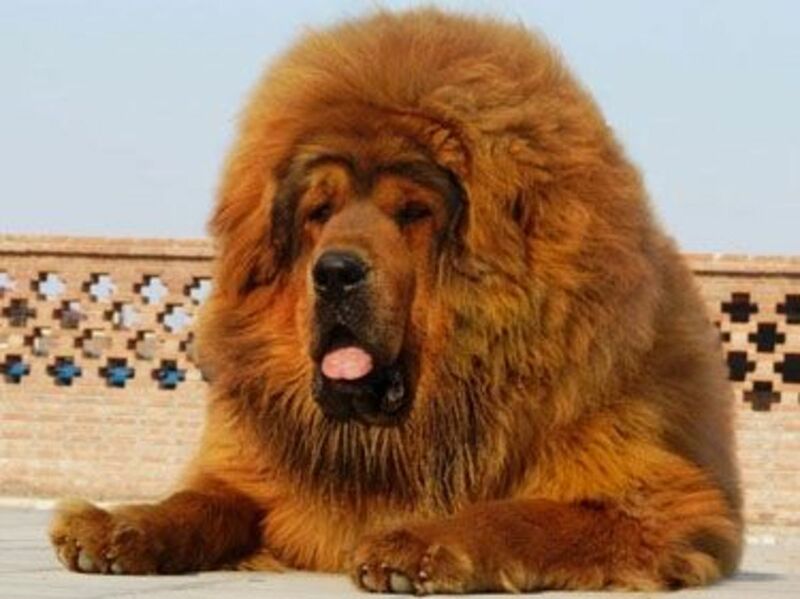 The common Mandarin Chinese name is Zang'Ao, which basically means "Tibetan Mastiff," or better yet, "Tibetan Big Ferocious Dog," is apt since the breed has a reputation for being fierce with strangers and extremely protective of their owners. There are two types of Tibetan Mastiffs: the Do-khyi ("door guard" is a rough interpretation), which were traditionally used as flock and home guardians, and the Tsang-khyi (which roughly means "dog from Tsang"), which were used as temple guards. The Tsang-khyi is generally larger than the Do-khyi, with males often averaging around 30 inches and weighing in around 180 lbs. It seems that Western breeders are breeding for size, as it's not unusual to find dogs that are over 31 inches tall and weigh over 200 pounds (the largest weighed in at 282!). Oh, by the way, this breed also has the distinction of currently being the most expensive dog on the planet. 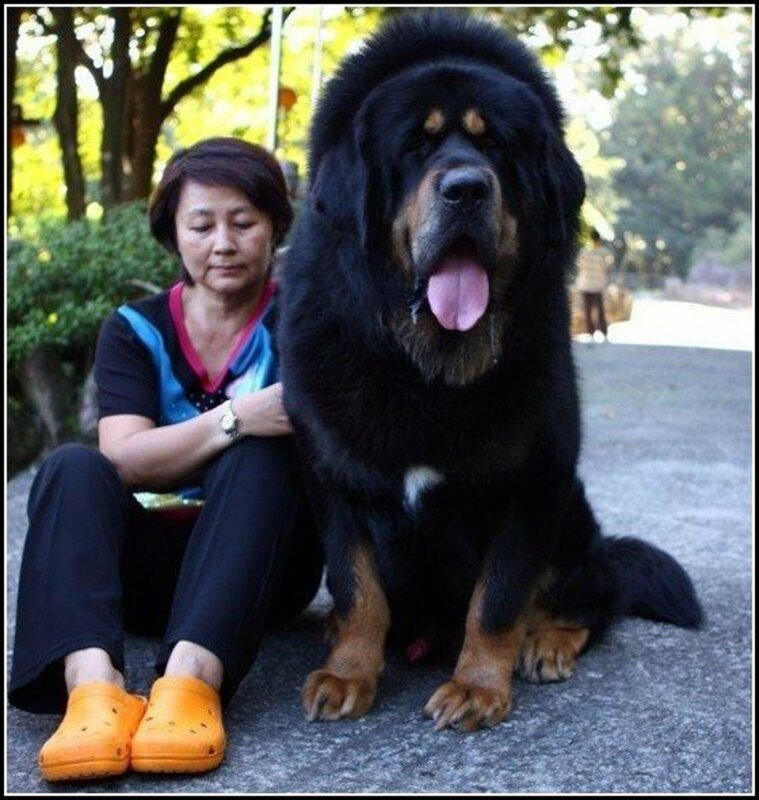 In 2011, a Chinese man paid $1.5 million for a dog named Big Splash, a beautiful red 11-month-old Tibetan Mastiff, who, at the time of sale, was nearly 36 inches tall at the shoulder and weighed about 180 lbs (remember, he wasn't full-grown yet!). And let's not forget that Big Splash took the most expensive dog title away from another Tibetan Mastiff, Yangtze River Number Two, who sold for over $600,000 in 2009. As if the price tag wasn't daunting enough, apparently these prized pooches are fed a special diet of beef, chicken, abalone, and sea cucumber! According to the Guinness Book of World Records, the heaviest dog ever was an Old English Mastiff named Hercules. The poor thing was grossly overweight and was beaten for the title a few years later by another Mastiff named Kell. Yes, somewhere under all that skin is a dog. 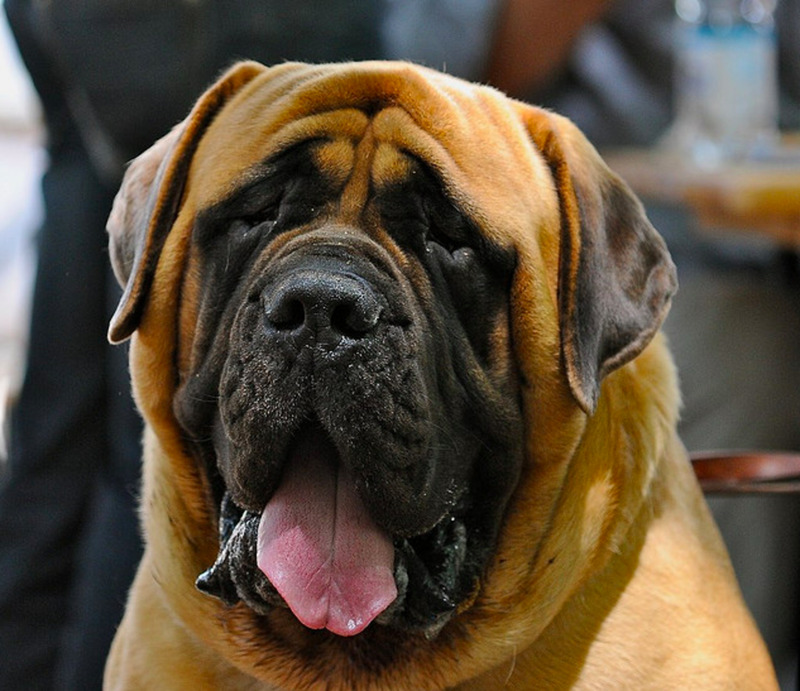 The Mee Kyun Dosa (or Korean Mastiff) looks like a cross between a Neapolitan Mastiff and a Sharpei (or like a dog wearing a skin suit five times too large). It's hard to tell with all those wrinkles, but a Dosa generally stands about 30 inches tall and weighs around 180 lbs, making it just smaller than the typical Tosa Inu and just larger than the typical English Mastiff. 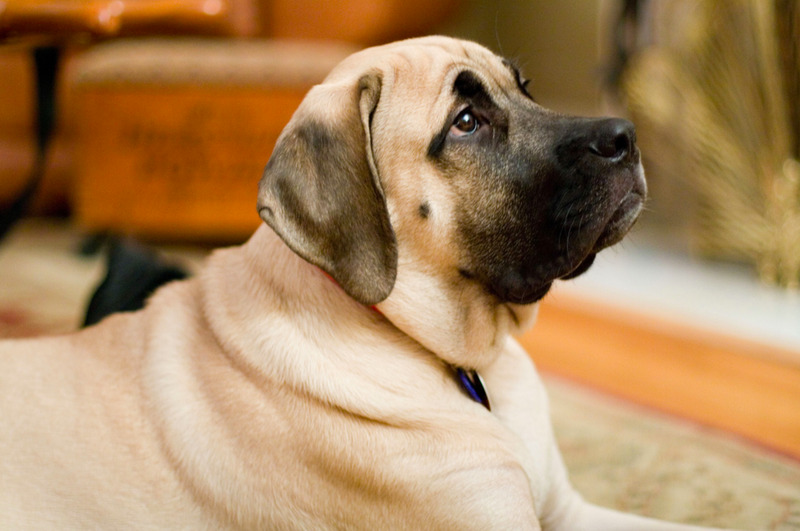 The Korean Mastiff is rarely seen outside of Korea, where they were developed from crossing Tosa Inu, Dogue de Bordeaux, and possibly Bloodhounds and Neapolitan Mastiffs. Despite their fighting dog ancestry, Dosas are known for their gentle, loving nature and their rather sluggish movement (you try moving all those wrinkles!). Rather than moving gracefully, they lumber like bears. Dosas make great companions, although they were bred to be guard dogs (and are sometimes used for fighting in Korea). 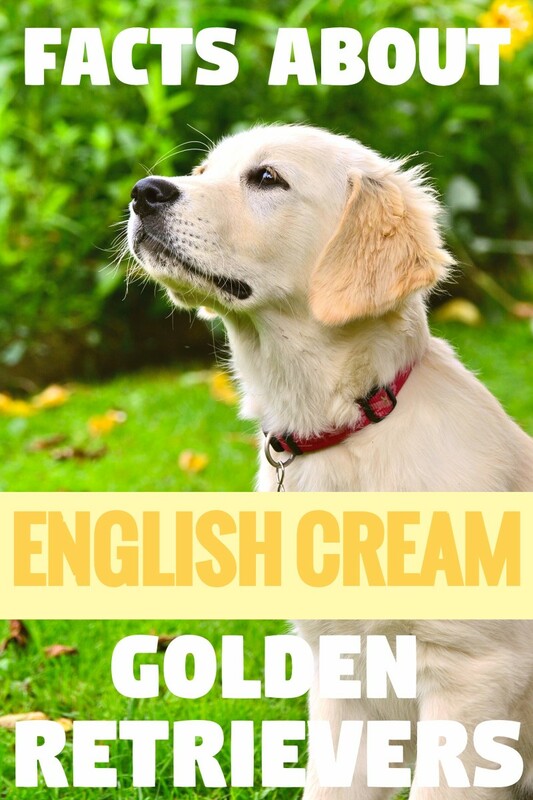 These pretty pooches have smooth, shiny coats in red, mahogany, and chocolate. 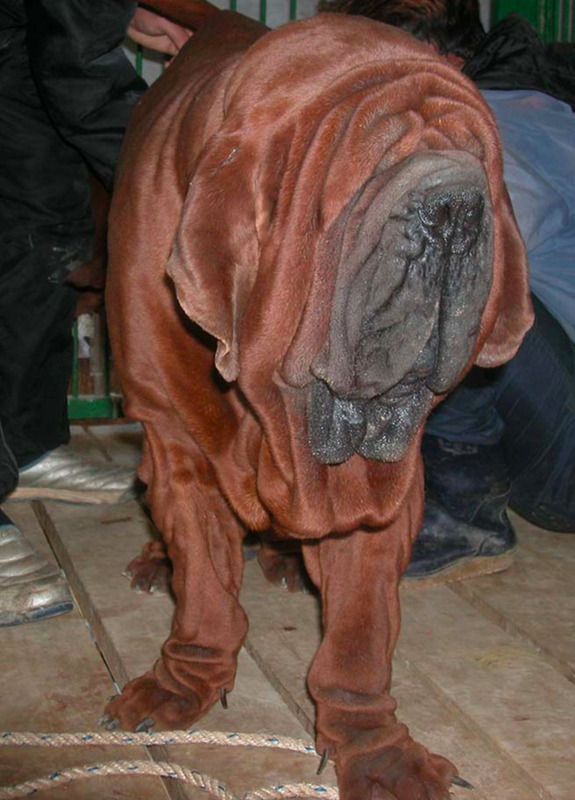 The Tosa Inu, also known as the Japanese Mastiff, is known as the sumo wrestler of the dog world. In fact, the most prized Tosa fighters are often honored with the title Yokozuna, the same title as the highest-ranking sumo wrestlers. The Tosa is also known as the Tosa Touken, which means "Tosa fighting dog." Like many of the breeds on this list, there is no upper limit to the height or weight listed in the Tosa's breed standard. Males Tosas average 28 inches in height and weigh around 200 lbs, though many Western breeders are breeding for taller, heavier dogs, so it's not unusual to see a Tosa who is upwards of 30 inches and 220 lbs. Because Tosas have been bred for fighting, they have a tendency to be aggressive, though with proper training and socialization Tosas can make great companions. 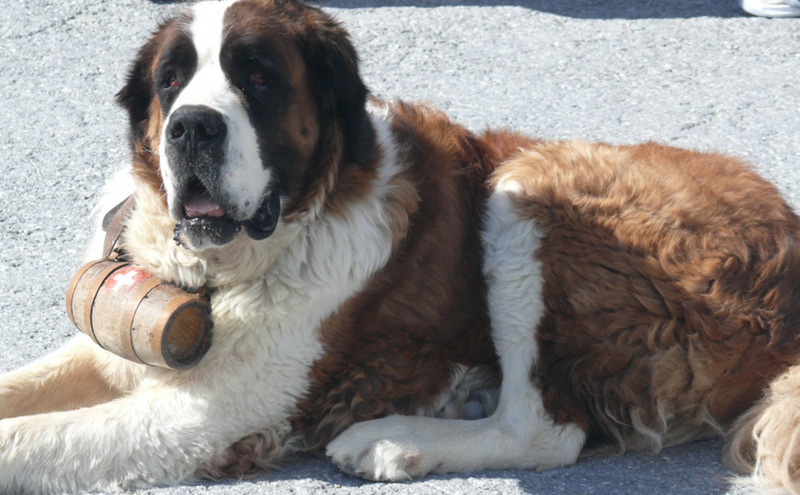 Tied with the Tosa Inu for position #4 is the St. Bernard, perhaps one of the most recognizable dogs on the list. Unlike the majority of breeds on this list that were bred to fight, hunt, or guard flocks, the St. Bernard was bred to rescue people and flock animals in the Italian and Swiss Alps. Their name comes from a traveler's way station in the Alps founded by the 11th century monk Bernard of Montjoux, who became Saint Bernard. These loving dogs average a height of 31 inches and a weight around 200 lbs, though much larger individuals are often seen (the largest on record was 315 lbs). The original St. Bernards did not have the long coats seen today. This coat developed in the 19th century after the St. Bernard population was decimated by avalanches. The breed was crossed with the Newfoundland to regain its numbers. Unfortunately, the long hair would freeze in the snow, and many St. Bernards lost their traditional jobs. Due to their docile nature, they quickly became family companions and flock guardians. The Spanish Mastiff is the largest of the flock guardian breeds. Like many others on this list, there is no upper limit to size in the breed standard, but male Spanish Mastiffs are usually about 33 inches at the shoulder and weigh around 200 lbs. This breed is well-known for its livestock-guarding abilities and will face down a wolf or a bear without a second thought. A properly-trained and socialized Spanish Mastiff also makes a great family companion. They tend to be calm and protective, but can be aggressive towards other dogs, especially those it feels are threatening its herd (and by "herd" I mean you!). Like several other breeds on this list (notably the Mee Kyun Dosa), the Spanish Mastiff tends to have a lumbering walk, giving the dog an appearance of clumsy laziness. Don't be fooled, though: when needed, these dogs can move quickly to defend your sheep (or kids)! Despite the Great Dane often holding the "tallest dog" title, it's second on my list. These dogs are definitely the tallest, often standing at 34 inches at the withers (on their hind legs, they can reach close to 7 feet tall!) In fact, it's unusual for any dog other than the Great Dane to hold the title for world's tallest dog (the current pooch stands around 43 inches at the shoulder). However, Great Danes are not typically the beefiest dogs. Not that they aren't 200 lbs of pure muscle. These are sleek, powerful critters, well-suited to hunting large animals and war. Danes make great companions. They tend to be gentle giants who get along well with both people and animals. Unlike some of the other breeds here, Great Danes don't usually exhibit a strong prey drive. Their friendliness doesn't mean they aren't protective of their families—and who's really going to mess with such a large barker coming at them? Finally, the #1 largest dog breed, the Pyrenean Mastiff (not to be confused with the Spanish Mastiff, though they may have developed from the Spanish Mastiff). These beefy dogs are usually around 32 inches tall and weigh upwards of 220 lbs. That makes them tall and brawny! The breed originated in the Pyrenean mountain region of Spain. It was developed as a flock guardian and as such does not have a strong prey drive but may exhibit herding behavior. They are docile and somewhat lazy until it's time to work. 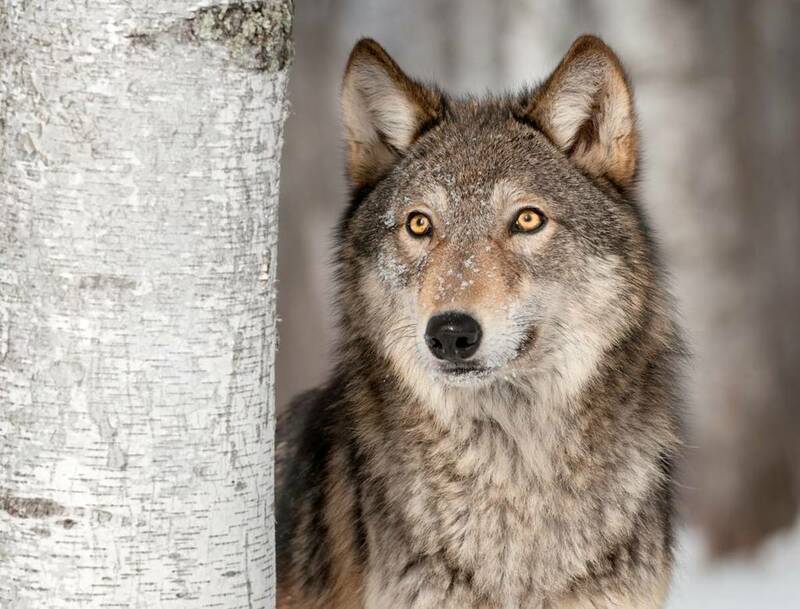 They were a flock's only protection against wolves and bears in the Pyrenees; their size and protective nature ensured a flock's safety. Aggression towards unfamiliar people and other potential predators is encouraged in a flock guardian. Even so, the Pyrenean Mastiff is generally a very calm, loving dog who rarely barks and only shows true aggression when given no other options. ...that the majority of large dog breeds on this list are mastiff-types? This type of dog is called molosser, which is derived from the ancient Molossus breed associated with the Molossian tribe of ancient Greece (are you seeing a theme with the name yet?). It is believed that the Molossus breed had a wide, short muzzle (similar to mastiffs) and was primarily used as a fighting and hunting dog. Of course, there is another camp that claims that the Molossus was actually a lightweight dog, more like the modern Greyhound, and that the modern mastiff-type came from an entirely different ancient dog, the Alaunt, which is thought to have looked much like a Caucasian Ovcharka. The interesting part of this theory is that the Alaunt is believed to have descended from a mastiff-type dog known as the Sarmatian Mastiff (which is thought to have been a close relative to the Caucasian Ovcharka). 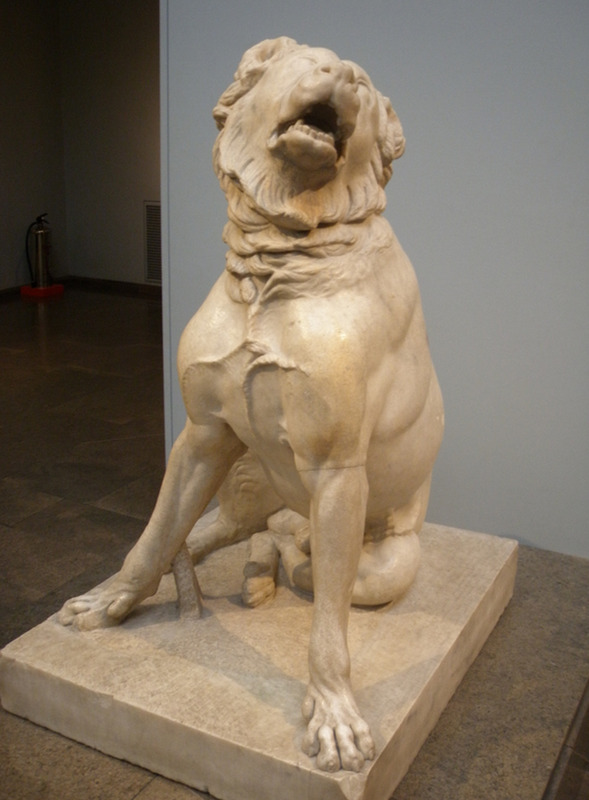 In other words, at some point there was a darn big brawny dog from somewhere in the ancient world that was the ancestor to the modern day mastiff-type dog. I realize that I have left off several popular large dog breeds. This may not sit well with some of you, but they couldn't all fit on my list (then it wouldn't be a top 10!). So, what's my justification for leaving off some breeds like Newfoundland, Dogue de Bordeaux, Irish Wolfhound, Greater Swiss Mountain Dog, and others? I created a spreadsheet of large (ok, giant) dog breeds. On it, I listed average heights and weights for the males of the breeds (females are generally smaller), then sorted by weight, then height. The top ten made my list. Simple as that. Here are the next twenty or so breeds that did not make the list but deserve to be mentioned. Some of my faves are here! Do you think my list is fairly accurate? Did I forget a breed? Please join the discussion in the comment section below! I love, love, love big ol' lovable doggies. Great article. My Dogo Argention was the largest dog I have had. He weighed in at 110 Lbs. He was adorable and cuddly. In the future, I am looking to adopt a Great Dane from a rescue. Thanks for your awesome info. MY black Russian TERRIER was very large he weighed just over 170lbs and stood just over 33" to his withers. He was especially trained for my own protection in Russia as a bodyguard against Jew-hating attacking thugs. He died just before his 10th year. I now have another two one almost the same size and another even larger and heavier than my first one whom will remain forever ingrained in my memory as a very special loving faithful friend. l would love to get a saint Bernard ,l love watching the movie about Beethoven the saint Bernard. it's a great movie and l think everyone online would love to watch it. it's hilarious and this giant breed shows courage and determination to do what is right. Great Hub. You included good information about large dog breeds. Some I did not know and I have written dog articles for years. Growing up, I always thought I wanted a Great Dane, but we ended up adopting a Mastiff. We lost him at a young age, and would certainly love another one in our home. I have never heard of a Boerboel, or some of the others . . . wonderful, informative article! @anonymous: We have a great also, he's very sweet &amp; gentle but they will show aggression towards anythig that they deam to be a threat to their "herd" ie. your household which will include other pets as well as people just an FYI. I would advise slowly introducing her to other people &amp; well socialized dogs over time (they usually take to people easier). Ours currently lives with a pitbull to whom he's bonded with &amp; is very socialized with other dogs of our friends &amp; family. We still have bought of aggression with new dogs bc again any hostle actions towards himself or anyone in our household he meets with aggression (it's just their nature, they make awesome guard dogs), it just takes time, their very stubborn. Training can be a bit tough to because of that stubborn trait but again it just takes time. Hope this helps! Akita giants at 240lbs from wolf breeds. Watched film on two Akita's getting into lions pen and taking meat away from the big cats, the lions ran away from the Akita's!! My girlfriend has a Golden Great Pyrenees, she is a real sweetheart but I worry because she is "iffy" with other people and some dogs. She was adopted, like we literally found her wandering lost and alone. She is the sweetest dog to us, but I want to introduce her to my mom/rest of family and worry. Also if we ever want to get another dog. Any advice would be helpful. Great article! Yes, top breed Cane Corsos are much more in height and weight than what you have noted. 120-140 lbs. Ours (male) is 130 on the nose. Just the tallest dog in the world - the Irish Wolfhound! Caucasian mountain shepherd is huge! 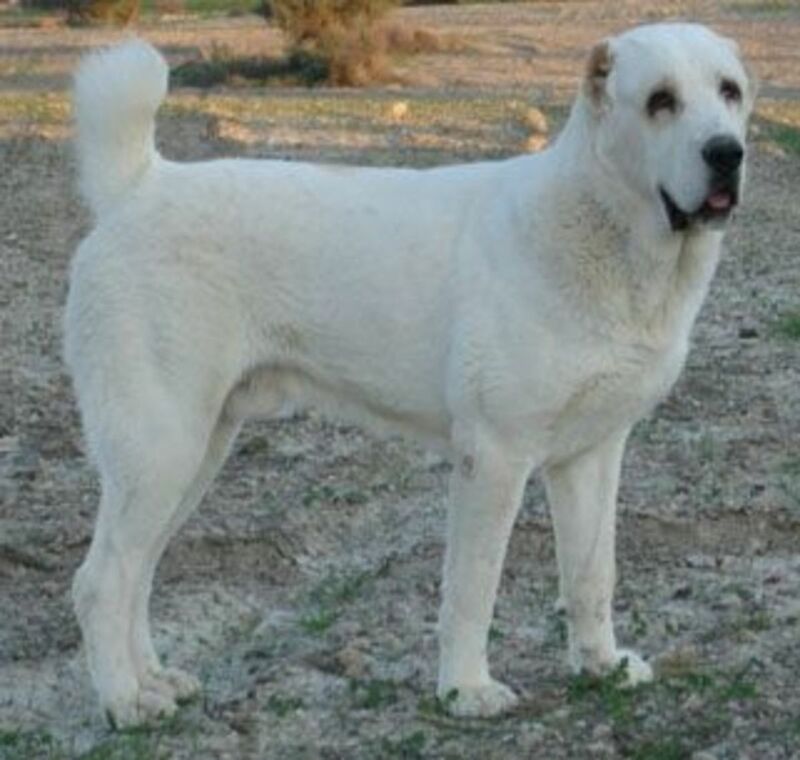 @anonymous: The Anatolian Sheppard from Turkey is a very large dog also but in weight they are no match for the Mastiff. The list was compiled in regards to the average of both height AND weight. Unfortunately for the Irish Wolfhound, the other dogs on the list just happen to be a little beefier. They're still gorgeous dogs though. Nice job! The bully kutta or Pakistani mastiff is anywhere from 30" to 42" tall and weighs 154-198lbs. How did you miss this? Irish wolfhound isn't on the list..
@anonymous: Jess gotit right. Chows just don't have the size to be considered a large breed. They are more of a medium breed. They also happen to be one of my fav breeds too! I miss my Chow, Pooh....such a sweet dog!! I LOVE newfies! But I'd love any of these big guys. Small dogs just don't cut it. first list to have em all. thanks you know your dogs buddy. @anonymous: I'm going to guess it's because it's not a giant breed. Weight: 45 - 70 pounds (20 - 32 kg)"
They are cute dogs though! Why isn't the dog breed, the Chow among this list? If you don't mind me asking? @anonymous: I'll recheck the breed standards for the Cane Corso. I believe I used the FCI standards for it. I know that this breed is generally larger than listed, but I had to go by breed standards for all the breeds to be fair. @anonymous: I'd be happy to research the breed if you can remember the name. 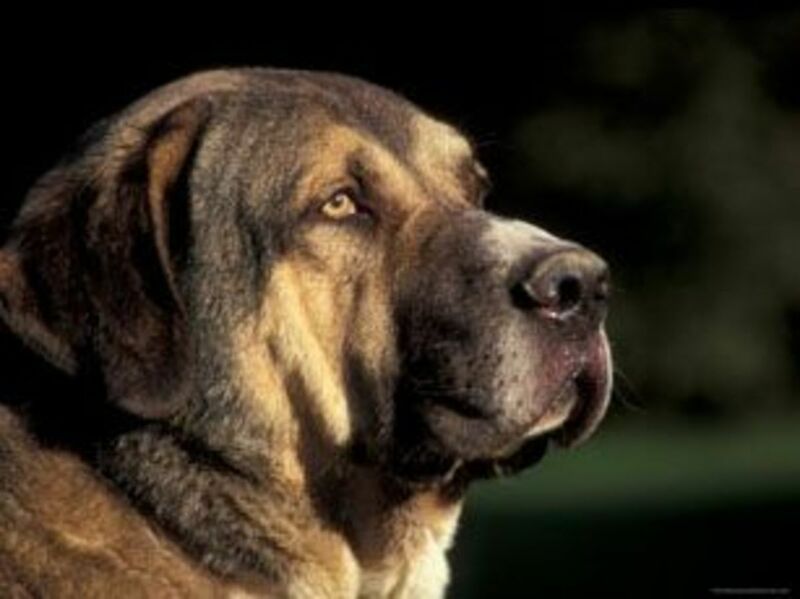 If the head/neck was similar to the Tosa, then it's definitely a molosser breed (mastiff). There are so many molosser breeds....I should do a list of just those! @anonymous: True, individual specimens of each breed might be much larger than the average listed. Certain breeders may consistently produce larger individuals. However, you have to think of these dogs as outliers- not the norm. I felt sticking with breed standards was a fairer way to do things. @anonymous: true. If you check the tallest dog alive, or guinness, it will give you great danes as the tallest dogs on record. @Akitajitsu: The old standard for the Corso was Males- 25-28" 110-130, Females-90-110lbs. The AKC and its minions, breeding only to standards vs function and restructuring the breed to type by bringing boxer(the goofiest and most useless breed over 45lbs) blood into the mix has significantly reduced the Corso. I've even seen 88-100lbs for the standard. These dogs are larger than Akitas 99 times out of 100. Luckily, a silly breed like the boxer can't be used to restructure the Akita, so they have remained a solid, hard nosed dog. You have the Cane Corso as an average of 26 inches, and Rottweiler, Bullmastiff, and Dogue at 27 inches. It's very common knowledge that Corsos are normally taller and more imposing than these breeds, and the standard usually reflects that. The correct average weight of a male corso is 120-150lbs. The Caucasian Ovcharka is normally bigger than the CAO in stature, not always weight. Some Kangal dogs being bred overseas are much bigger than any of these dogs. I found your list interesting to say the least. My fiancé and I where discussing the largest dog breeds and she decided to do a web search to find a listing. This brought us here. Unfortunately A breed I learned of a few years back was not here. I don't know the breed name, but I do remember I couldn't pronounce it. I do have some info I remember from my discussion with the owner and my own observations. Appearance: fir was short coarse and grey. The head/neck was similer to the Tosa Inu. The tail seemed odd to me, possably undocked but still disproportunately small. I realise you included only (AKC or otherwise) recognised breeds. The one I am looking for may not be, however I do know that there is a club for dogs/owners of this particular breed. The club is either bassed in, or has a Michigan (where I live) chapter. @anonymous: I tried to stick with dog breeds officially recognized by at least one major kennel club. (for instance, KC, FCI or AKC). I couldn't find either the Bully Kutta as being recognized by any breed registry, including the Kennel Club of India (which seemed the logical place to start). The same goes for the Serbian Defense Dog (also known as the Srpski Odbrambeni Pas). As for the Cane Corso (also known as Cane Corso Italiano, or Italian Mastiff), that's an interesting problem. Several breed standards list the average male's height between 24-27 inches and their weight between 99-110 lbs. That means the Cane Corse would be below the Akita on my list of Honorees. However, I did read some articles by breeders that suggested that those averages were low and that the average should be more around 28 inches tall and 145 lbs. However, other breeders say that these larger specimens are the result of relatively new breeding programs to produce heavier dogs. I'm willing to update my list of Honorees to include the Cane Corso, but to be fair to the other breeds, I have to go by the breed standards listed by the kennel clubs. Great lens. These are some BIG dogs! @anonymous: According to my research, male Great Pyrenees are generally between 27-32 inches. I apparently made a typo or miscalculation in spreadsheet, because an average of that range would be 29.5 inches, rather than the 28 inches that I wrote. I'm going to bump the Great Pyrenees up on my honoree list. Thanks for pointing that out! Great Pyrenees are significantly bigger than you think, but it is important to measure the larger males, as the females tend to be quite a bit smaller. For example, my last male was 31 inches at the shoulder and weighed around 200 lbs. He was massively built but not as tall as many males I have seen. I would put average male height at closer to 32 inches. That Tibetan Mastiff looks like a cross between a lion and a dog! Excellent lens.I have always been partial to larger dogs. It is a nice lens, i like big dog. I am a real dog lover and have always had at.least one dog. We have for the most part had rescue dogs and we have been blessed with great companion dogs. Thanks again for so much information. @anonymous: I did include the Central Asian Shepard Dog (Central Asian Ovcharka). I tried to stick with breeds that were recognized by at least one major kennel club (for instance, KC, FCI or AKC). I couldn't find either the Bully Kutta or the Gull Dong as being recognized by any breed registry, including the Kennel Club of India (which seemed the logical place to start). If I missed these breeds in the kennel club lists, then I'll be happy to restructure my list - although I think we all agree that if it's a mastiff, it's probably one of the biggest breeds in general! A vet who can't spell. Sounds credible. I have never heard of or seen most of the dog breeds mentioned. Only started looking when I weighed my 4 year old Great Pyrenees and he was 208 pounds. I am sure list is accurate. But as local dogs go, mine is the biggest in my mind. Great dogs. Maybe you should put to your list Tornjak and Sarplaninac, they are large dogs, they come from Balkans. I am no expert, but I think that they might be put to this list.Keep up the good work! Nice lens! I had a wonderful Neapolitan Mastiff and he was anything but aloof and wary of strangers. He was the exact opposite. He never met a stranger he didn't immediately love! He also was well over the average weight you have listed. He was just shy of 200lbs. Did you forget these or is there some other reason you didn't add them to your list? I am a vet too and I think she hit it pretty well on the head. You didn't do any of what you said you did at all. I am going to say that you are not a vet, you have an English Mastiff and your pee pee just felt like it got a little shorter. I AM a vet and you are wrong buddy. The list may not be 100% right with singular dogs but on average it is. Don't worry just go buy a Hummer or something and you will feel "adequate" again. what about kangal and illyrian shepherd? @anonymous: yes it was. sorted by weight then height of the male. Newfie. Brave and loyal. Lewis and Clark took a Newfie on their journey west. Good list...provides information on and about breeds most of us did not know. And, surely some folks will be upset that their breed is not in the top 10..tough! I never knew there were Giant Alaskan Malamutes. Trying to envision how huge these dogs are. Highly innacurate list, beginning by not introducing the criteria that is being used. Is it weight or is it height? Or is it a combination of both? The only way the Great Dane could be second would be by height only (beaten by the Irish Wolfhound). Anatolian Shepherd dogs can actually be quite large, as well. I mention it only because there is a local woman who owns one, and when I first saw her, I thought she was walking a pony. @anonymous: It was hard to decide which ones to include. 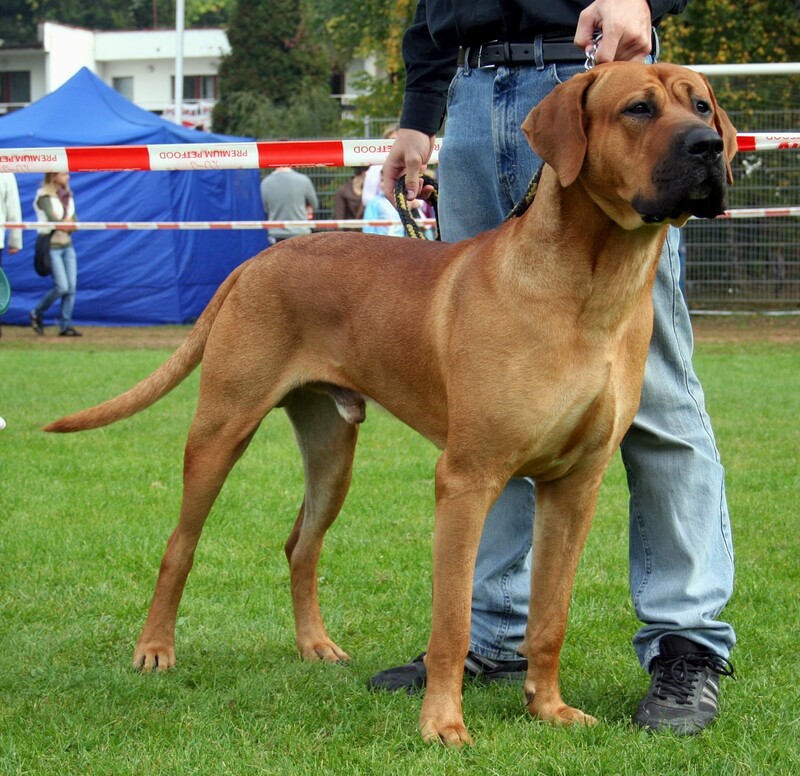 Several big breeds were left off, the Sarmatian Mastiff only got a brief mention, as did several other large molossers. Perhaps I should do another lens dedicated to just mastiffs! @anonymous: Actually I'm not a huge mastiff fan - though it does seem like with this lens! I do love the looks of the Tibetan Mastiff and the Spanish Mastiff though. I prefer my dogs to have some fluff and most mastiffs are smooth-coated. They are pretty impressive dogs though! You left out the Sarmation mastif, who is indeed one of the largest dogs in the world, similar to the great dane in size, but with more muscle and a stronger bite! This breed was mentioned by you however you did not include this ancient breed who surprisingly exists today! Although rare, if you google it, you may find information on this dog.......But I do commend you on your diversity, in mentioning The Spanish mastiff, The tru Tibetian mastiff, (both types), and The larger type Alaskan malemute, which I have seen first hand! over all, good job! My Irish Wolfhound will eat your Mastiffs for breakfast. Caucasian Ovcharka is a pretty dog, though I own 2 Irish Wolfhounds, the worlds largest dogs(on average). I think 35 inches and 150lb is the minimum male spec as the dozens i know are 150-200lbs and 35-40 inches. @Vikk Simmons: The Great Pyrenees is on my list of honorees! @sojourner-1: That's his natural look. Many Tibetan Mastiffs aren't red (they are most commonly black with tan markings) and aren't that fluffy. The dog in that pic, Big Splash, was valued so high partly because of his unusual beautiful coloring and fur - he's like a giant Chow Chow! Well, I don't see the Great Pyrenees....:) Great page. Wow #6 is crazy looking--is that groomed to resemble a lion?